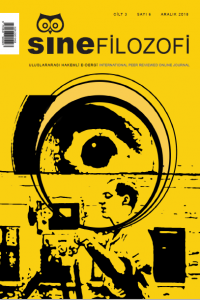 SineFilozofi is an international, peer-reviewed, widespread, periodical electronic journal published twice a year. The journal, which has an interdisciplinary structure between the fields of cinema and philosophy, aims to provide grounds for international academic debate in the field. SineFilozofi has adopted the policy of providing open access. The journal does not charge APCs or submission charges. The Journal is not commercial, and access to the journal content is free. SineFilozofi operates on the basis of volunteerism. No royalties are paid for the articles, book and movie reviews or interviews that are published in the journal. Articles sent to the journal should not be published elsewhere or sent for publication. Works published in the journal cannot be used without a proper reference. Eleştirel Teori Açısından Hümanizm ve Mekanik: Alex Murphy Nasıl RoboCop Olur? Dergimizin yayın süreçleriyle ilgili herhangi bir konuda irtibat kurmak için sinefilozofi@gmail.com adresine mail gönderebilirsiniz.